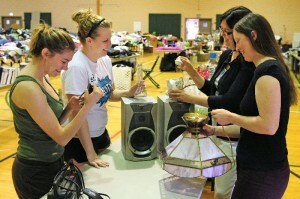 SUNY Oswego’s Leave Green sale, continuing 9 a.m. to 5 p.m. Friday (May 24) and 9 a.m. to 2 p.m. Saturday (May 25) in the Campus Center’s Swetman Gymnasium, takes days of collecting students’ donated food (already given to area food pantries), clothing, electronics, books and other goods, followed by more days for setup. From left, SUNY Oswego senior childhood education majors Emily Fulfarr and Talia Harrison assist Christy Huynh, associate director of the Compass student success center, and Alyssa Amyotte, coordinator of the Center for Service Learning and Community Service, prepare for bargain-hunting community residents in the annual three-day fundraiser for the Newman Center’s People Against Poverty campaign and the local Rescue Mission. The effort diverted seven tons of items from the waste stream, compared with 4.85 tons last year, according to the college’s sustainability coordinator, Jamie Adams, and sustainability engineer, Mike Lotito.